Koreatown is situated between Madison Avenue and 6th Avenue on West 32nd and is the home to over 150 businesses. K-Town is THE destination spot in NYC for Korean BBQ, and I got to dine at Sam Won Artisanal Korean BBQ Restaurant recently. Although Sam Won is the newest Korean BBQ establishment on 32nd, this is not their first location as their history goes back 42 years with its beginnings in Seoul, South Korea. Sam Won is known as one of the oldest Korean BBQ restaurants in South Korea. 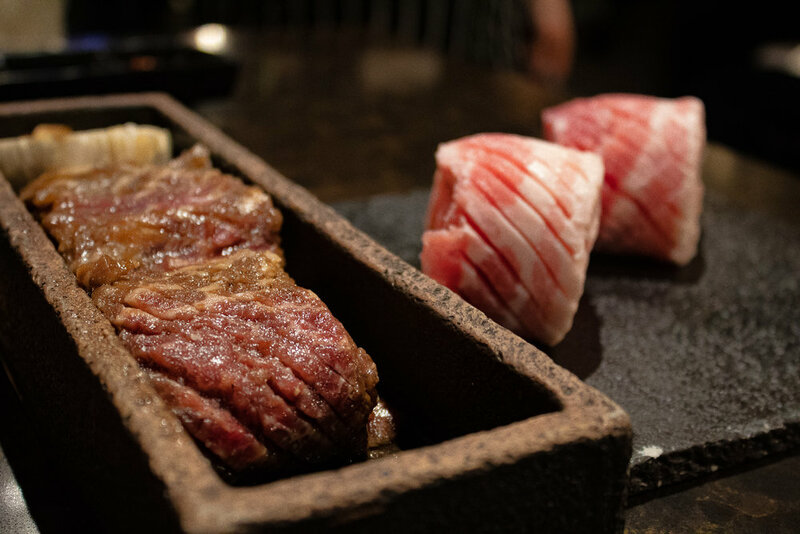 It has been mentioned they spent over 5 million dollars to bring this luxury Korean BBQ experience to the Manhattan in a space that encompasses 10,000 square feet, 3 levels, and can seat 180 hungry BBQ patrons. If you have never had Korean BBQ, it is best served in larger groups of at least 3 or more. You will first pick your meat, and you will be provided with banchan which are sides that include veggies, pickled items, and white rice. I ordered Samwon Galbi which is the traditional marinated Korean beef short rib and the Pork Belly. This location does require you select 2 orders of meat for their barbecue options, and you should expect to spend at least $70 bucks on this portion of the meal. After eating the Pork Belly and Samwon Galbi, I was stuffed, and therefore I highly recommend ordering any additional foods or sides AFTER you have almost finished your BBQ. The menu at Sam Won includes other traditional items such as stir-fry glass noodles, egg souffle, and kimichi stew and they have incorporated more contemporary dishes such as house poke, kimchi poutine, and kimchi cheese fries. The waitstaff at Sam Won pays close attention to each table, and although you might have several people check in on your table during the BBQ portion of dining, they are all in sync of what is going on with the meal. Sam Won has been opened almost 8 months now and they will surely not disappoint you. I would recommend making reservations but walk-ins are welcomed as well for this dining experience. The meal I received from this restaurant was comped, but the views are my own as I only post restaurants I would visit again in the future and genuinely enjoy. My reviews, comments, and recommendations are not influenced by this restaurant.